To win the passage of real bail and discovery legislation in Albany, our elected officials need to feel the heat! We have the power to win this year however, crucial Democrats in Long Island, Westchester, and Hudson Valley have yet to support bail and discovery legislation. 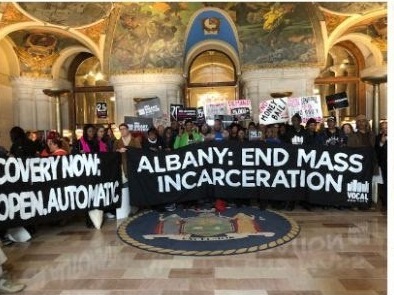 Will you call State Senators Kevin Thomas, Anna Kaplan, Monica Martinez, Shelley Mayer, and James Skoufis to demand that they support criminal justice reform in Albany this session. If the bail elimination act is passed this session less Black people, and other people of color, will have to spend time in jail while waiting for their trial. This legislation would limit the bracket for pre-trial detention and ensure some form of justice for our people. With the passage of discovery legislation New Yorker's will no longer be essentially "blind-folded" while they wait for their trial without know all the evidence that is held agains them. Unlike most of the country, prosecutors and police are not required to provide copies of police reports and other crucial documents, information, or evidence related to their case to people facing criminal allegations or their attorneys until the trial begins. This unfair law fuels mass incarceration, case delays, and wrongful convictions--but this legislative session we have the power to change this by passing the Discovery for Justice Reform Act. We are getting close to winning criminal justice reform in New York but we need State Senators Thomas, Martinez, Kaplan, Mayer, and Skoufis to sign on to these bills in order for them to pass.